Greetings, friends. We’ve got a quick Community Update this week, but one that we hope still serves as an essential pit stop for all your Halo ponderings and insatiable interests. As the Fall weather begins to settle in, we’ve been keeping an eye on your findings since Anvil’s Legacy, Halo 5: Forge, and the Halo app dropped. We’ve been checking out amazing clips, celebrating your victories, and tracking feedback and reports. We’re actively investigating issues impacting the “My Bookmarks” screen on both Xbox One and Windows 10, reports of server weirdness since the update, ISP specific reports impacting EU Pro League, and plenty more. Additionally, the Multiplayer Team just kicked out Covenant Slayer, which features custom starting weapons and map layouts (as it pertains to weapons on map). Earlier this week, they also put out some minor quality of life enhancements for the BTB playlist – minor tweaks to intro and outro cameras, slight adjustments to exact weapon placement, and related quick fixes. Additionally, we’ll be working with community Forgers on line of sight and performance feedback, as we know some of you have noticed that base-to-base play on some of the community-made maps can get a bit chunkier than normal, especially if one is ready to wreak havoc with the Sniper Rifle. Lastly, the Multiplayer and Services Teams are finalizing planning for future seasons – the Fall season will end at the end of October, and the winter season will begin thereafter. Brace yourselves. 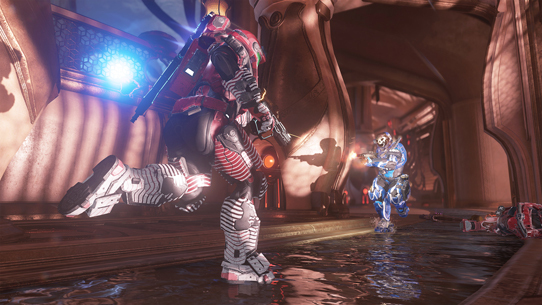 Additionally, there’s more brewing on the Halo 5 front, and we’re not done just yet. Various teams here at the studio are hard at work finishing up a few different flavors of goodness, and we’ll be talking about all of that and more in the near future. I am particularly excited about that part. And lastly, this one. We miss you, Spartan Fresh! This transitions us quite well into Grim’s tales, which detail gear, tournaments, and more. Take it away, GB1. It’s been a pretty solid week for your friendly neighborhood GrimBrother; watched Bama beat Ole Miss, was front and center for Sigur Ros in Seattle, and started putting some slick new paint jobs on my own personal M12S Warthog in Forza Horizon 3. And maybe best of all, Halo: Fractures launched successfully to deliver some awesome brand new stories to Halo fans across the globe. This week your beloved Barvo-bolstering buddy has plenty of cool catch-ups to share from a myriad of Halo happenings, so let’s dive in, shall we? My earliest personal Halo memories would be incomplete without the experiences of lugging a CRT the size of a UNSC frigate to various apartments for some in-person friend-fragging, or hosting annual competitive gaming summer camps at our science center in Tampa – with an obvious bias towards whatever the current Halo title happened to be at the time. Even with the incredible advancements the industry in general has made to let people compete head-to-head across both neighborhoods and oceans alike, there will always be a very particular magic about being there at a competitive gaming event. Thanks Grim! It’s a pretty ridiculous understatement to say that I’m really looking forward to the upcoming HCS Open events this season. An Open event brings an experience full of comradery, competition, laughs and friendship. With both 4v4 FFA events, players have multiple avenues to prove they have what it takes to compete with the best. Seeing all the interest and passion around FFA has been fantastic, and it’s going to be exciting to see which new names break into the scene. And of course, competing on Main Stage is its own beast. All eyes are on you, and everyone is watching. The crowd roars as you make a game-changing play. Chills will fire up your back, taking your attention off the game for just a moment. You know everyone watching in-house and online just saw the play – maybe you even crack a smile – but you know you’ve got to redirect your attention back to the game at hand, and go for the win. Moments like those are the ones I’ll never forget. Over the years I’ve attended countless Halo tournaments. Too many to count. Attending an event is more than just competing, it’s a time to get together with friends both old and new, and just kick back, hang out and have fun. An Open event is so much more than a competition. It’s a family of players joining together to do something they love. Couldn’t have said it better myself. Whether it’s HCS Orange County, HCS Las Vegas, or at events still to come down the road, we can’t wait to see you in attendance! This week we also announced a brand-new addition to the Halo social family, @HaloGear. Whether you’re a casual collector or a graduate of the Kevin Hurd Academy of Artifact Acquisition, @HaloGear is your official home for keeping up with the latest news and happenings for Halo merch, clothing, toys, and more. I sat uncomfortably close to Consumer Products officer and Livestream-crasher, James Monosmith, to get the skinny on the new social digs. GRIM: So James, your team just launched the new @HaloGear account, and it seems to be going pretty well so far. Can you tell us just a bit about the overall philosophy behind having a dedicated social space for collecting Halo stuff? JAMES: So far, so good! Really, it comes down to the fact that we have such an amazing and passionate fan base. For as long as I can remember, celebrating that passion through collecting has been woven into the very fabric of the Halo franchise. We wanted to create a convenient, official space for our community to get news, talk about, and generally rejoice in their collections. GRIM: We noticed that you’re starting off with a bang, so to speak… what’s up with the giveaway you have going on right now? JAMES: You can’t have a Gear account and NOT do giveaways, that’s just a travesty! So, we are indeed starting out with a bang by giving away the brand spanking new UNSC MA5 BOOMco Blaster from Mattel. This bad boy is a fully automatic blaster rifle that actually appeared as a weapon skin REQ in Halo 5 MP. Did I also mention it’s signed by 343? GRIM: I don’t think you did, actually. JAMES: It’s signed by 343. GRIM: Good to know! 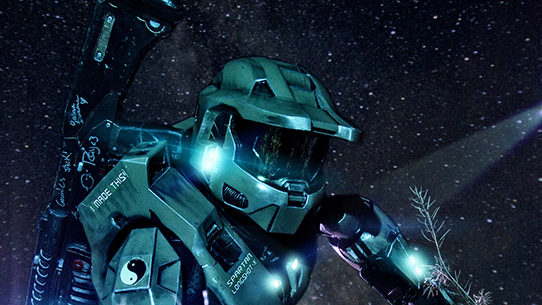 Moving on, tell us a little bit about what’s going on with the Halo Consumer Products team at the moment. What kinds of things are you most excited about working on right now? JAMES: It’s never a dull day for Halo CP. We are working on SOOO much great stuff; from Mattel action figures to MEGA Bloks, our very own Halo Legendary Crate, Books, Comics, Statues, Replicas, Shirts, Hats, Cars, Bikes, Aprons, Sanders, Golf Carts…. JAMES: Ok some of those might not be coming out – I just get excited. Speaking of which, I am ALL about Halo Wars 2, that’s what really has us geeking out lately. Can’t way to show off what we have in the works for February. GRIM: It better be a sander. JAMES: It’s not a sander. GRIM: Fine. I’ll settle for an Atriox apron. What is personally your favorite Halo-related item that you own and/or have worked on? JAMES: I would have to say the Mattel Energy Sword. JAMES: It’s something that we have wanted to make FOREVER and finally got the opportunity. Plus, it’s freaking sweet. GRIM: Indeed it is, James. Indeed it is. Thanks for joining us today! And thanks for letting me draw on the MA5, too. 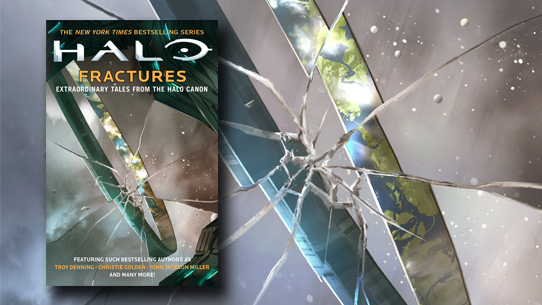 This week in lore-land, we’re celebrating the successful launch of our latest short-story anthology: Halo: Fractures. The collection features a smorgasbord of stories scattered over several settings across the Halo universe. From the waning moments of the ancient Forerunner era, to deep and impactful tales that pick up where Halo 5 left off, there’s pretty much something for everyone here. Now that fans have started getting their hands on the book, we’ve seen lots of discussion beginning to pop up throughout several canon-curious community corners. With that in mind, we thought it would be fun to chat a bit with some of Halo: Fractures’ internal 343 contributors about both their prose and their process. Let’s see what they had to say! GRIM: Thanks for joining us, guys! What made each of you choose the specific corner of the universe to play in for Fractures? MORGAN LOCKHART: I really liked Evelyn and wanted to tell more of her story and the story of Meridian. When I first thought about the story presented in her audio logs, I knew I wanted to describe a person who had seen all the cycles of Meridian and had been through the hell of this ongoing war. She was there the first time Meridian was destroyed, tried to come back to save it, and she finds herself here after it has suffered another major catastrophe. She has grit, but you can tell its wearing on her. I figure hers is the story of many of the “little people” in our universe. KEVIN GRACE: Technically artificial intelligences are computer programs, but Smart AIs are born from a human mind and (dis)embody a whole new being from that mind. Life and death and birth have as powerful a hold over artificial human beings as real ones, and I wanted to take a peek into all those topics as the importance of AIs in the Halo universe grows. BRIAN REED: I originally wanted something like the [Rossbach’s World] scene in Sydney to be in the final moments of Halo 5. Production realities being what they were, this story found its way into prose rather than cinematic, but that’s great because we got to spend considerably more time with Osman and company than the game cinematics would have afforded us. GRIM: As “internal” authors, can you each talk a bit about how might the writing process differ versus someone who is “outside” of the organization? MORGAN: We have more available to us to choose from, knowing what we do about the minor details of everything presented in the game. I definitely wanted to take advantage of that and write something that I knew someone outside of the game team probably never would. Mine was one that was more of an extension of one of the games and less of a jump into the rest of the universe. KEVIN: It’s incredibly helpful to understand of all of the upcoming stories planned for Halo so I can cook up large and small connections (and avoid stepping on any toes as best I can). But really it’s not too different for internal writers because 343’s Franchise Team does such a good job bringing all new creative partners into the fold so they have all relevant and interesting Halo details as each new project begins. I think the quality and Halo-ness of the stories from all the external writers in Fractures attests to that. BRIAN: I’m not sure how much it does honestly, but then again I’m not as day-to-day with the novel production itself as others. We still pitch our stories, we still run drafts past Franchise Team for approval, etc. 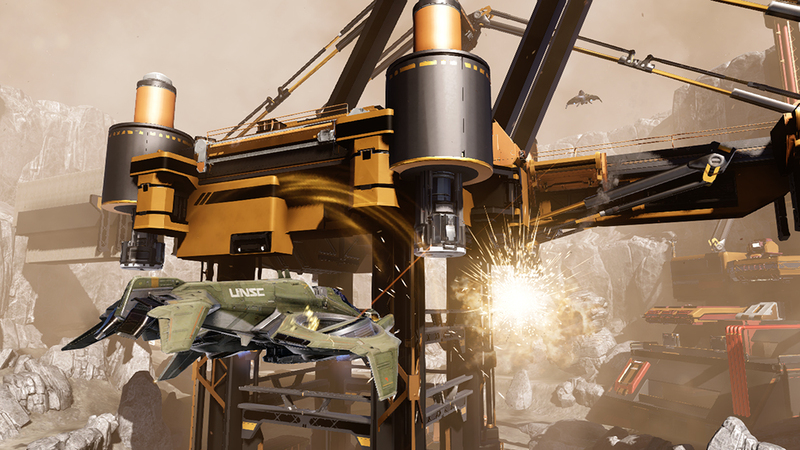 The biggest difference for us as 343-employed writers is that we can more easily introduce new continuity elements since part of our job description is steering the direction of the larger Halo universe. GRIM: Having worked on both sides, how would you describe the creative process of writing a more linear short story/novel as opposed to the work you might do for a game? MORGAN: There’s not a lot of comparison between a short story and developing a game’s story. With a short story, you pick a fairly small idea and you structure it in a way you think it is compelling and you hone it (hopefully with feedback from others); either until it is “done” or you eventually arbitrarily stop honing and/or hit your deadline. While there are still a few limitations presented by source material, you have a lot of control over what it is and how you tell it and thus how the reader experiences it. With the game, you need a have lot of ideas, both big and small, and they have to work within a lot of limitations presented by the game – all of the various mechanics, the level structure, co-op vs single player, etc. And a lot of people work on it together and it has to continue to change over the entire process as the structure of the game and the gameplay changes. You’re constantly aiming at a moving target and changing as things evolve. You’re also not just working with words. You have all the other elements of the game that are telling the story as well, from the mechanics to the environments to the vignettes to the music, and so you work with those teams to be sure that the story is consistent there as well. On top of all that, you ultimately have very little control over how the “reader” (player in this case) experiences it, with perhaps the exception of cutscenes. As a narrative designer, I work with the in-level narrative – so you have to build something that can be experienced in multiple ways depending on how the player chooses to interact with it. KEVIN: Writing a short story is mostly just me and a keyboard and “is this idea interesting enough to borrow 20 minutes of anybody’s time?” Writing for a game involves sometimes hundreds of people and hundreds of meetings and…yeah. Put another way: Sometimes you want to play solo campaign, and sometimes you want to play capture the flag. Both make for a great night of fun, but coordinating 250 flag runners is an interesting gig. BRIAN: Prose involves using correct punctuation and complete sentences; more often than not at least. Also, the threat of massive production-related changes is near-nil. But mostly, there are just fewer wild dog attacks working in prose than in games. GRIM: “Fewer” for sure. Morgan, fans have been pretty excited about your story, “What Remains,” particularly in regard to how it explores – like you mentioned earlier – a much “smaller” and more personal story. Can you talk about what inspirations you had for the setting of the tale? MORGAN: I like survival stories; especially survival horror, though What Remains is not really that. I grew up in the woods and would play out survival scenario games a lot as a kid. I loved Gary Paulsen books. I’ve also really enjoyed the Marvel Front Lines set alongside their big cinematic events, and the “little person story” side of What Remains takes a page from those as well. GRIM: Keen-eyed (and eared) observers have picked up on the fact that your story centers around and includes characters encountered in very peripheral ways in the game, including Evelyn Collins – heard in Halo 5 cinematic chatter on Meridian – and Doc Cale – referenced in one of Halo 5’s audio logs. Is it particularly fun to flesh out some of these smaller perspectives? MORGAN: I think so, yes. I like narrowing the focus of our epic game down and being able to dig deep and hit on the emotional impact of these events. Also, I wanted them to experience and react to Cortana’s takeover in the way they would, which is mostly with confusion and uncertainty. Cortana is everything to us, those of us who play the game and read the stories, but she really isn’t anything to the rest of the universe, necessarily. I imagined it would be a bit of a “huh?” until, obviously, [stuff] started to go down. I don’t think I did that ending quite as well as I’d like to, but that’s okay. GRIM: Kevin, “Anarosa” deals with some particularly intimate themes, such as the collateral emotional effects on loved ones at the prospect of having someone “become” an AI. Can you talk a little bit about dealing with these types of subjects against a sci-fi canvas? KEVIN: My hope going into the story was that the sci-fi backdrop wasn’t the most important part of the story once the scene was set. Sure it’s the future and we’re making AIs and colonizing the galaxy and such, but the question that sparked the story for me was “if someone I loved died, and there was a chance that part or even all of that soul could be brought back, walking around out there somewhere…maybe heroically, maybe in anguish…how would that affect me every single day?” Sci-fi helps set up this specific decision for Anarosa’s brother, but the “how” of AI creation in Halo was established some time back. I was more interested in what happens in the moments just before and after. GRIM: Your story also goes into more detail of the nature of AI in the Halo universe. What’s your personal take on the task of elaborating on such a subject – something you’ve also had to deal with in other ways while crafting the story for Halo Wars 2? GRIM: Ahh, cleverly coy as always, Mr. Grace. Touché. Now Brian, your story turns attention from the bigger “broad stroke” elements of Halo 5’s narrative towards a much smaller and more intimate setting – but one that is directly connected to the effects of Halo 5’s events. Can you talk a bit about the nature of crafting a smaller story within the new “rules” recently set up by a larger one? BRIAN: Halo 5 was all about turning the Universe in a new direction explicitly so we could do stories like this. We wanted the galaxy to be big and scary and dangerous in a way that it really has not been for our heroes in a while. There’s a threat level now potentially on-par with the Covenant in its glory days, but unlike them, this threat knows everything there is to know about us. Even something as basic as traveling from one planet to another is once more a deadly proposition in the Halo Universe. So once we had that up and running, it was fun to finally start to play in that setting at a very personal scale. To me, it’s always interesting any time the people that are usually in charge are running scared. When’s the last time you think Admiral Hood was as nervous and uneasy as he is now? Or that Osman was as unsure of herself as we see her on Rossbach’s World? That’s where we are now for our entire Halo universe cast, emotionally speaking, and it’s an exciting place to be. GRIM: Regarding the return of a more ever-present danger, the juxtaposition of both Halsey’s and Cortana’s “ends justify the means” approaches create a very precarious pot vs. kettle conundrum, with a lot of different lives – human, alien, and artificial alike – caught in the middle. Can you talk a bit about the power of “choice” and how these themes have impacted Halo’s story from the very beginning? BRIAN: Oh, man, this topic is a whole Canon Fodder column unto itself! But the short-short-short version: Every decision we make in our day to day lives is echoing down through history, affecting future generations in ways we can’t imagine or comprehend. But we always (at least I like to think this is true) try to make the decision that will serve everyone best going forward. For example, the Forerunners knew that if they didn’t build the Halos, then the galaxy falls to the Flood. Of course they’re committing galactic genocide to stop the Flood… but the Forerunners didn’t just subscribe to “the ends justify the means”, they damn near invented the concept in some ways. Does that mean they were right? Likewise, if Halsey didn’t kidnap children and perform her wildly unethical experiments on them, then she would have been correct in her assessment -- humanity would have fallen to itself, or eventually to the Covenant. Does that mean the personal pain and suffering she caused was “worth it”? Now we have Cortana who, like those before her, has made a decision whose cost she deems worthy of the results. Galactic peace. An end to war and suffering. Just do as she says… or else. This, like the decisions of the Forerunners and Halsey before her, has led to untold death and destruction in the name of the greater good. Is she right? Wrong? Exploring the answer to that question is a big part of the future of the Halo Universe. GRIM: It absolutely is. Thanks so much to all three of you for sharing your thoughts this week, and for your awesome contributions to Halo: Fractures! Well, that will do it for yours truly this week. Also, for Halo fans who also happen to love fighting games, the Killer Instinct team just released their brand-new Shadow Lords mode on Xbox One and Windows 10 PC, which means that you’ve got not only the Arbiter character to choose from, but also Fractured Ward – a Forerunner monitor making his debut in the new mode as a buff-providing guardian. Look for me this week either on the Warzone Firefight battlefield, the aforementioned Shadow Lords mode, or perhaps careening through the Australian outback via my Forza Horizon 3 drivatar. See you out there. Until next time… Live well, play Halo, and try to Keep your Promises. Earlier today, Teh Spearhead sent me a Machinima trailer that claimed to be on a whole ‘nother level. The work did not disappoint. Behold – the trailer for Black Mamba from the team over at Digital Infinity. Unyshek: Hey Arturo - it’s nice to have you here with us this week! ArturBloodshot: Hi John, I'm glad to be here. I'm very excited to be part of this Community Update. I've seen a lot of cool creations that came along with the Anvil's Legacy update, and it's an honor to be chosen with other great Forgers to show the community what can be done with the tools we’ve been given. Before we start discussing your map, Unearthed, I’d like to start by stepping back a bit. 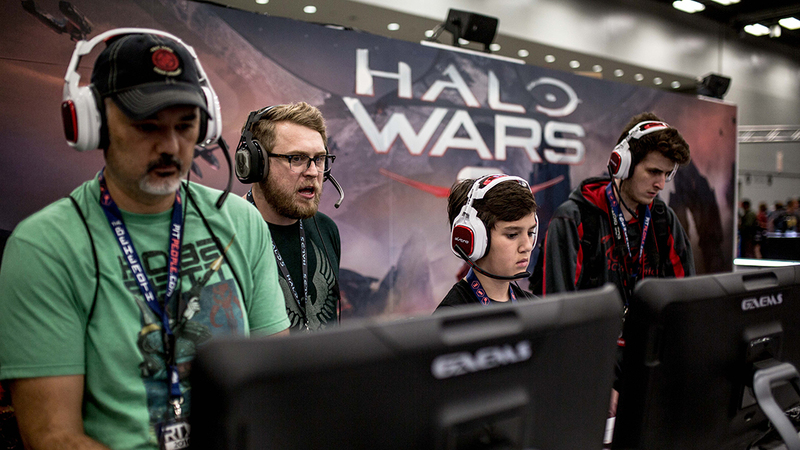 When did you start playing Halo, and when did you start playing around in Forge? I started playing with Halo: CE. I remember gathering with my friends at their house, ordering pizza and creating mayhem. Since then, I've been playing every Halo game. When I was a kid, I always liked to create environments and buildings with Legos; it was a way to develop my creativity. When Forge arrived with Halo 3, I said to myself, "This is where I belong." Since then, I've been Forging like crazy and have always tried to give the community the best experiences. Our long-time readers probably recognize your name from the terrifying Infection map, The Cellar, which we featured some time ago. I must say, ever since then we’ve been keeping a close eye on all of your Forge creations, and you haven’t disappointed. However, I’ve been very curious to ask what made you transition from creating the scariest Infection mode we’ve ever seen, to creating this beautiful Big Team Battle map? Throughout my Forge career I've created every kind of map, and well... besides Halo, I also enjoy horror games. With the inclusion of terrifying elements in Forge, I focused myself on making immersive Infection maps, including The Cellar. However, I got a little tired of making those maps, so when this year's Meet Your Maker Forge contest was announced, I saw an opportunity to go back to creating core maps, and this time it was going to be a huge one. What was your vision for the map when you first started building Unearthed? Did you always imagine it being this giant pit with a giant crane in the middle? Yes, I’ve always wanted to create a BTB map with a circular layout that had pathways on a circuit surrounding a great building in the middle, where players can also battle. Since I’m an architect, when I decided that I wanted to start building this map, I immediately sketched out my ideas on paper. With my pen and paper, I designed every section of the map, from the main bases to the position of the excavator. Creating this original layout helped me have an idea of what I was going to do, and not lose track of my work. Other details and aesthetics came within the process on Forge. If you had to choose a section of the map that was the “most difficult” to build in Forge, what would that section be? The Excavator was by far the most difficult part to build. Its functional design was difficult to conceive because of its main, and central position. I had to achieve making a platform that would serve as a reference, and objective for the players, but also it couldn't be too overpowered when compared to the ground level. Considering these factors without sacrificing any of its aesthetics and form was very challenging. In fact, it took more tests and changes than I can count to obtain balanced gameplay. I’m assuming you’ve heard this plenty of times, but when I first played on Unearthed it really reminded me of Spire from Halo: Reach. While you were building the center rig, were you aiming to please fans of Spire? (Laughs) Like I said before, the idea was to create this kind of iconic building to push players to control it. Maybe the image of Spire crossed my mind for a second, a lot of images sprouted in the creative process. Spire was a distant inspiration while trying to create the top area, and my map definitely shares some of the same concepts. The map stands out as a unique Forge map, and even more so as a unique Big Team Battle map. What is one of the coolest moments you’ve had while playing on and testing this map? Have you jumped off the crane and been able to connect with a Ground Pound? Yes, I did! I remember testing the first version of the map, I connected a Ground Pound over the Flag carrier and then switched to the Spartan Laser and annihilated a Warthog that was trying to avenge its teammate, killing both the driver and the gunner for a Triple Kill. There were a lot more of these epic moments because the countless hours of testing, but with this first one I felt that my map was achieving its goal. Now that this is complete and in matchmaking, what’s next for you? I have so many projects in mind, from creating more immersive Infection maps to building impressive core maps. Unfortunately, I don't think that I’ll have the time to fulfill each and every one because of my architecture career (it just drains my time! ), but I will try to Forge whenever I can. My next project is another Infection minigame, which won’t be as scary as The Cellar, but it will definitely be more chaotic. I'm just waiting for the perfect time to share it with the community. Can’t wait to see it. Thank you again for joining us today! Thank you for having me, and I hope everyone enjoys Unearthed! Grab the map here, check out ArturBloodshot on Twitter here, and YouTube here. If you’ve been paying attention the past few days, the Play of the Week will come as no surprise to you. The Pro League matchup is Evil Geniuses versus Enigma6, we're in Game 5 Slayer, and when we switch to Ninja's POV, the score is 44-44 with 0:07 on the clock. Take it away, Ninj. That’ll do for this week. Thanks for joining us, and we’ll be back again next week with more.